Have you ever noticed how a simple joke can raise your spirits? Maybe a friend tells you a funny story, and your mood immediately improves. Humor has the power to make you feel better when you are upset, and by harnessing it when life gets tough, you can get you through the difficult moments. 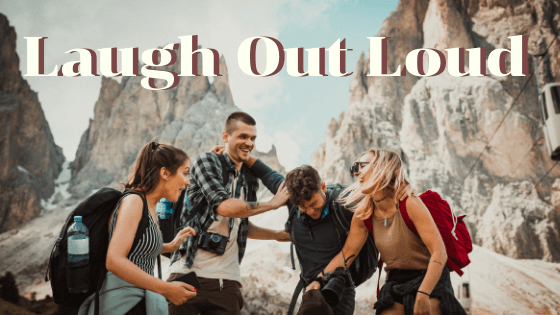 In this article, you will find out the top three reasons why you shy away from a giggle or chuckle during difficult times. Solutions on how to fully embrace laughter will be shared, as well as information on how it can improve your health. It could be that you are suffering from the loss of a relative. Try remembering a characteristic of your loved one that brings you joy. Or perhaps you currently focus too much on limitations rather than possibilities. Make an effort to recall a happy moment from your past when you felt invincible. By focusing on funny memories, you are embracing humor, which can release the pain and frustration that you feel. Yet you might feel guilty for uplifting yourself out of the grief, and you choose to avoid humor for this reason. You may experience discomfort in making that joke or retelling that happy story, because you fear these things are inappropriate during troubling and bleak times. You dodge humor when you need it most, because someone may judge your smile for disregard of the difficult situation, and their criticism makes you anxious. If this is the case, take a moment to breathe, and remember, that you deserve to heal. Perhaps you are also failing to harness laughter during times of need, because you are self-consciousness. If you are evading humor because you are a perfectionist, and worry that your joke may fall flat, try being easier on yourself. Be mindful of the fact that your funny story can inspire others, and that you might motivate someone else to embrace joy instead of sadness. You are showing that they too can be strong, and that laughter is not a weakness. It’s possible that you steer clear of laughing in the midst of trauma, because you worry that this act will mask your true emotions. You fear you are fooling yourself. You want to be genuine, but smiling makes you feel like a fraud. If this is the case, remember humor is a resource to uplift and support you. Recognize that your experience with pain is valid. Funny stories and jokes will not take credibility away from the situation you are facing, but will provide a way for you to make it through. Our recent guest on the Living Full Out Radio Show uses humor daily to overcome embarrassment and frustration. David Harrell was born without a right hand. As a kid, David was ridiculed for his disability. He learned to make friends and overcome his self-consciousness by cultivating a funny attitude. In elementary school, David cracked jokes about being Captain Hook when he wore a prosthetic hook to replace his hand. He immediately saw amused reactions from others, and felt relief. Finding humor during hard times can make the difference between feeling defeated and being ready to overcome the moment’s challenge. Laughing to relieve the pain can show you that life doesn’t have to always be taken too seriously. It is difficult to make it through a loss or a transitional period, but it does not have to be so hard. Crack a joke, and witness how transformative that action is for your attitude, mind, and body. Laugh out loud, and experience that it reduces stress and pain. A burst of laughter relaxes muscles in the brain and body, protects your heart, improves your mood, and not to mention adds to joy to your life. Next time, when you are going through something, don’t hesitate to share that funny story, so that you are closer to healing, and living full out. To listen to this radio show please visit http://livingfullout.com/radio-show/. And click on Episode titled: Discover How You Can Manage Frustration and Embarrassment by Embracing Humor as you Live Full Out.